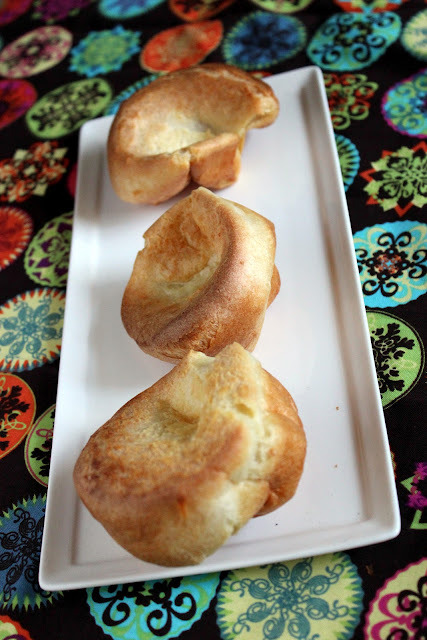 I've always wondered about those funny looking breads called, "popovers" but I never really knew anything about them until I stumbled on a recipe one day and I was intrigued even further! Popovers are light airy rolls with a crisp exterior and a pillowy inside, similar to a Yorkshire pudding. They seem like a breakfast pastry to me since they have a egg-y taste and are great lathered with jam. 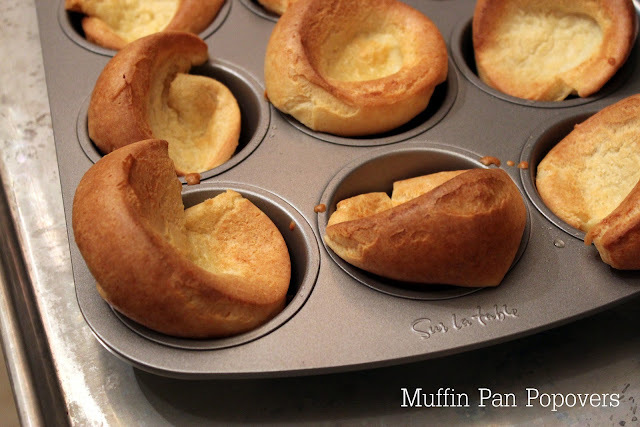 You can use a fancy popover pan, but the great thing about this recipe is these are made in just a regular muffin pan. They don't get quite as inflated as when using the popover pan but they were still pretty and tasted great! The hardest part about this recipe is following the directions exactly and not opening the oven door to prevent them from falling. Patience is a virtue, wait to open the oven door, so you find these beauties! Tips #1: The batter is very liquid-ey, don't worry, that is normal! Tip#2: Make sure your butter is bubbling slightly before adding the batter. after that the texture/consistency just isn't as yummy! Heat the oven to 425°F and arrange a rack in the lower third. Place a baking sheet in the oven while it heats. Place 1/2 teaspoon of the butter into each well of a 12-well muffin pan; set aside. Place the remaining 1 tablespoon butter, eggs, milk, sugar, and salt in a blender or in a medium bowl with an immersion blender and blend until smooth, about 30 seconds. Turn off the blender, add the flour, replace the lid, and blend until just smooth, about 30 seconds. Set the mixture aside in the blender. Place the prepared muffin pan in the oven on the heated baking sheet and bake until the butter sizzles, about 2 to 3 minutes. Remove the muffin pan and the baking sheet from the oven. 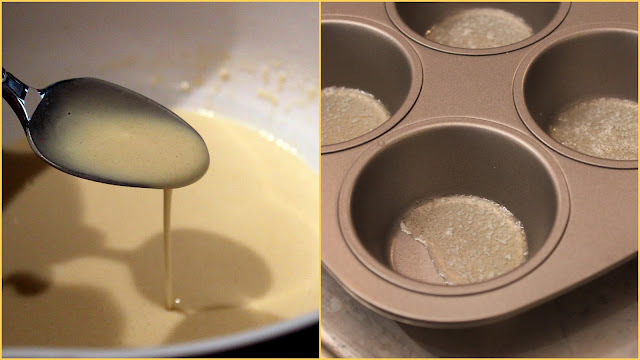 Pouring from the blender or bowl, fill the wells of the muffin pan halfway up with batter. Remove the muffin pan and baking sheet from the oven and place them on a wire rack. Remove the popovers from the pan and serve immediately. This recipe reminds me a lot of German pancakes. Is that what they are like? I'll have to try these and find out!